I recently programmed a 4-level game with Scratch. I used a honey bee for the theme. Each level used a unique piece of music designed to create anxiety in the player, making young players–and some older–freak out! Upon closer inspection, each level is not quite so difficult. It took about 70-80 hours to program the game. Player directs the bee through a honeycomb maze to reach the hive. Touching a flower along the way earns a point. Touching a black line makes the bee say “Ouch” and returns the bee to starting position. 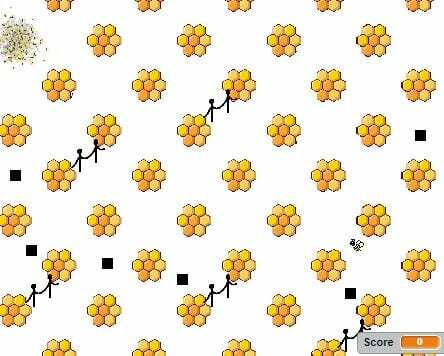 Player must move the bee diagonally between the honeycomb-shaped flowers to reach the swarm. Touching a honeycomb flower or being run over by the moving black squares returns the bee to starting position. 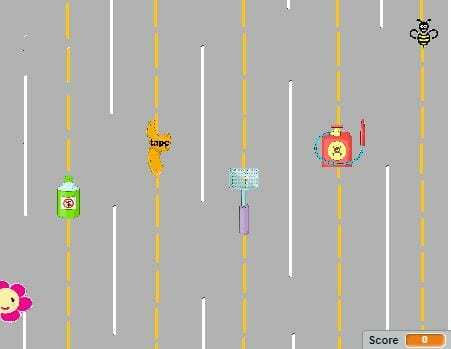 Player must move the bee safely across the highway to reach the pink flower. If the bee is run over by the moving fly swatter, fly paper, or insect potions, the player blows up and is returned to starting position. Player can’t let the bee touch any white lines or the perimeter of the background; otherwise, the sound of breaking glass is triggered and returns the player to starting position. 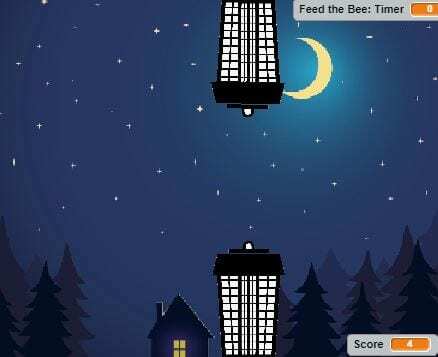 Player must help the bee fly toward the passing objects in the night sky while avoiding contact with the vertically moving insect zappers. Player has 2 minutes to earn as many points as possible. This video tutorial shows how the game appears to the player.